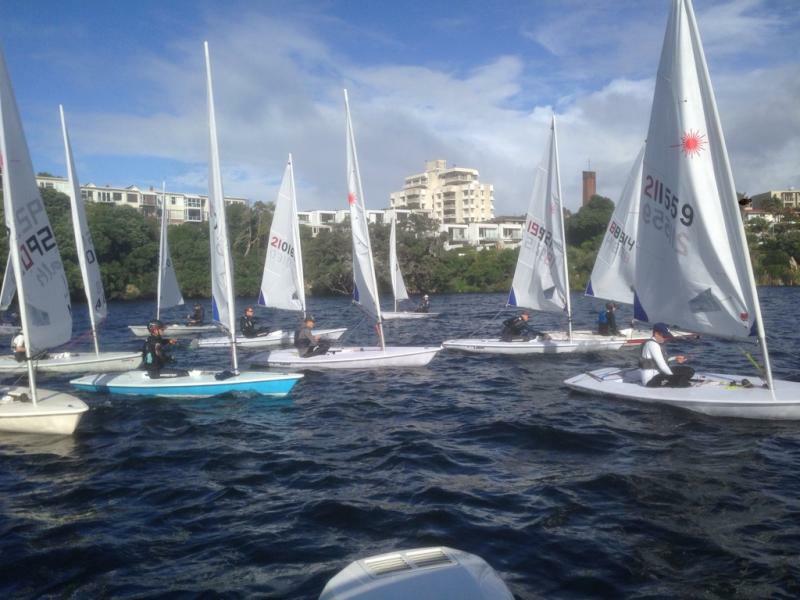 34 sailors entered the 2018 Northshore Freshwater Champs. Saturday had 12-18 knots from the Northwest with gusts up to 25 knots. Sunday had sun and a shifty 8-12 knots from the West. The Full rig numbers were down this year but the quality was excellent with Rohan Lord coming out top over Dave Ridley who was just ahead of Andrew Dellabarca who had driven up from Wellington. Winner of the Great Grand Masters was Gary Lock who redeemed himself with a 3rd in the last race. In the Radial there was an excellent turnout of youth, women and masters. Josh Armit series was ruined after a broken mast in race 2, but Luke Cashmore who won overall sailed a good series ahead of Harrison Baker. One to look out for was 13-year-old Caleb Armit who finished 5th. 1st Women was Samantha Stock in 7th and 1st Master Radial was Georgi Yankov in 12th. Our thanks to Race officer Garth Briden and to Commodore John Dowsett for use of his boat in the trying Saturday conditions. Thanks to Sandy Wilson in the Tower and the rest of the committee who made it a successful day with generous prizes. The next big Pupuke event is the North Harbour Masters in the 2nd week of November and there is regular sailing through the winter on Sundays at 1.30pm start time. 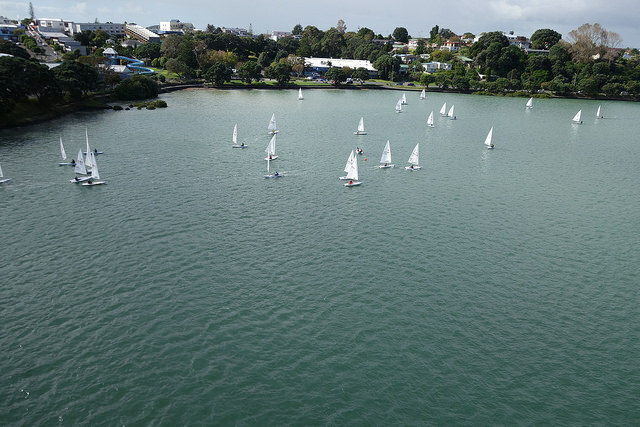 Nice sea breezes and a particularly strong youth Radial fleet were the features of the 2018 Auckland Laser Champs held at Torbay on 17th and 18th February. Saturday saw the sea breeze fill in early, with 10-15 knots for the 3 races and a decent chop. Sunday was overcast and the breeze never really got above about 8 knots but still provided good racing. In the 30 boat Radial fleet, Luke Cashmore had an excellent weekend, winning 4 of the 6 races to take out the championship. Behind him Torbay local Harrison Baker had was also exceptionally consistent, particularly on the Sunday with 3-second places. Third overall was Master Phil Wild, keeping the youth fleet honest, as did Susannah Pyatt who had two good wins on Saturday but was not able to sail Sunday. The Torbay youth squad stood out overall with Jayden Abbott, Ryan Harden and Logan Beckman in 4th, 5th and 6th all having a good weekend on the water. In the Standards there was a repeat of the contest from the recent Nationals in Christchurch with National Masters Champ Andrew Dellabarca making the trip up from Wellington worthwhile, taking out the contest from local Ian Baker with Cris Brodie third. GGM John Pitman from New Plymouth had an exceptional Sunday, winning two of the races to come in 4th overall, clearly preferring Sundays lighter condition. Results at the end of the final day 4 - Sunday 21st Jan 2018. Day 3 provided a classic day with a bit of everything weather wise giving everyone a chance at a top result. It was another hot Christchurch day with temperatures in the early 30's and the fleet was initially held ashore waiting for a breeze but by midday, a light southerly had set in so PRO Ross May got the fleet on the water and headed over to Charteris Bay for the start of race 6. The breeze was a patchy 5 to 8 knots with an outgoing tide, which proved a challenge to many, although the top Open and Radial sailors showed their class, consolidating their positions at the top of the fleet. The Southerly then died and after an hour or so wait a really solid sea breeze blowing up to about 20 knots accompanied by a good seaway came in for the subsequent two races of the day. 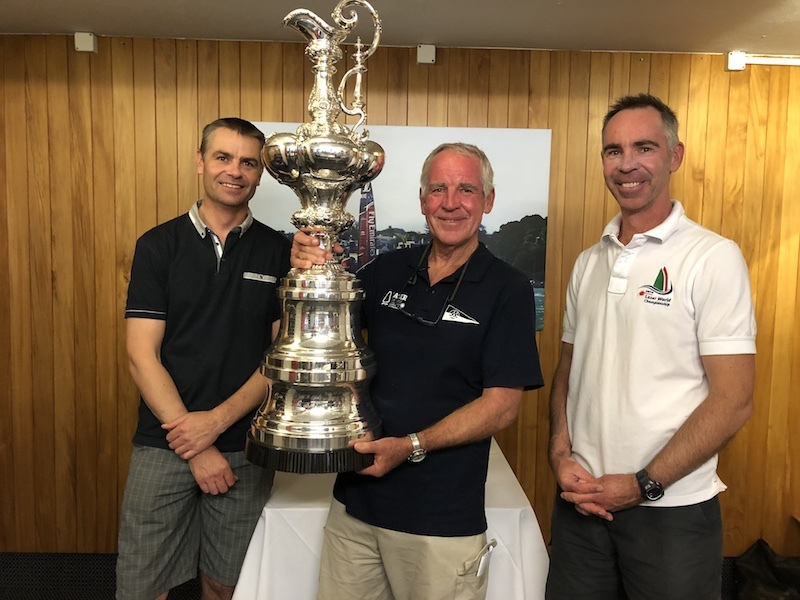 In the Standard Open fleet, last years champion Andrew McKenzie and Muritai's George Gautrey were in a class of their own, with Andrew (2/1/1) again just taking the honours for the day from George (1/2/2) to consolidate his claim to this year's title. Alastair Gifford and Matt Kempkers continued to fight it out for the third spot with Alastair holding a nice 5 point margin over Matt going into the final day tomorrow while a consistent Rohan Lord managed a 4th in race 7 to break the monopoly of the top 4. In the Radial, World Youth champion Josh Armit continued his seemingly unstoppable progress to the title, winning all 3 of today's races convincingly to retain his perfect score. In contrast, the contest for second is extremely close with Susannah Pyatt holding just a 1 point lead over Scott Leith. Scott had a shocker in race 1 today so now both Scott and Susannah have serious discards so both will be looking for 2 good races tomorrow as they endeavour to secure second spot. Behind then everyone had a bit of a mixed day, with Albert Stanley continuing to hold 4th spot and second in the Youths while Annabel Rennie Younger is second in the Women's and 5th overall. In the Radial Youth Womens Samantha Stock holds onto a two-point advantage over Elly Warren, with tomorrows two races critical to deciding the winner and who will go into the NZL regatta in front in the World Youth Womens selection contest. In spite of "observations" from a few Masters about how to survive 3 races a day both Masters fleets again enjoyed excellent racing. In the Standard Masters Andrew Dellabarca (M) had a hiccup in race 7 with an OCS but a 1/2 in the other two races still has him in front of Ian Baker (AM) by 6 points going into the final day in spite of Ian winning both today's windy races. Rob Woodward (M) moved into a clear third overall while Nick Page continues to lead the GM's but slipped to 5th overall after a poor effort in race 7 to sit just a point behind Pupuke club mate Tony Nicholson (M) who moved up to 4th overall. All the leaders in the Masters Radial found the light race a challenge but the status quo was re-established with the onset of the sea breeze to leave Ed Tam (M) leading from Hamish Atkinson (GM) with yesterdays star Jenny Armstrong (WM) holding 3rd after posting the most consistent 3 race results for the day with a 4/2/2. With only one discard allowable everyone will need at least one good result tomorrow. The forecast is again looking a little tricky tomorrow but hopefully, the predicted sea breeze will eventuate early enough to allow the final 2 races to be completed as scheduled before the 15:30 cutoff time. The supercomputers agreed with the weather gods today and we enjoyed 3 great races in a lovely 10-15 knot sea breeze, pretty much what was forecast. Everybody was ready to go at the midday start time but the PRO decided to wait half an hour for the sea breeze to settle in. There was a bit of ebb left in the tide when race 3 started at 12.30, enough to catch bag a few OCS's, but from then on the sea breeze settled, the tide turned, the cloud cleared and we enjoyed a beautiful day's sailing on excellent courses. In the Open Standards Andrew McKenzie (Kohi) and George Gautrey (Muritai) continued to battle it out at the front of the fleet with Andrew again winning the day with a 1/2/1, but having had to conceded one to George, who sailed a blinder to take out Race 4 and log a 2/1/2 for the day. The extra breeze today suited Matt Kempkers (Wakatere) who put together a 4/3/3 for the day but still trails 3rd placed Alastair Gifford from Queen Charlotte in the overall standings. In the Open Radial fleet, there was no stopping Josh Armit (Murrays Bay) who really showed why he won the U17 worlds, being dominant in all 3 races today to reach the halfway point of the contest with a perfect score. Behind him, his Murrays Bay teammates, Women's Olympic hopeful Susannah Pyatt and Masters champion Scott Leith, had a close battle with Scott's 2/3/2 just pipping Susannah's 3/2/3. With the discard getting rid of Susannah's OCS from yesterdays race 1 these two are only separated by a single point going into day 3. Annabel Rennie Younger again had a solid day to hold 4th overall although Albert Stanley and Olivia Christie both had great days and are not far behind 5th and 6th. Samantha Stock continues to lead the Youth Women although Elly Warren found the conditions much more to her liking and closed the gap on Samantha considerably. In the Masters Standard, the extra breeze was to the liking of Finn convert Ian Baker (Torbay), who flew upwind to take two Masters wins and jump up to second overall. However also enjoying the conditions was Wellingtonian and past champ Andrew Dellabarca, who scored a 2/1/2 to continue to lead overall. Behind these two there is a close group of aspirants, currently led by Nick Page (Pupuke) in 3rd overall, despite his succumbing to the outgoing tide start line trap in race 3, with a consistent Rob Woodward (Worser Bay) in 4th, while Cris Brodie (Pupuke) is now 5th after suffering speed wobbles and joining the Lyttelton Swimming Club in the last 2 races of the day. In the Masters Radial local hero Hamish Atkinson found conditions a bit tougher today, scoring a 3/3/2 to sit equal on points with Ed Tam, who's 2/2/1 for the day looked impressive. However undisputed Radial Masters star of the day was ex-Olympian Jenny Armstrong (Dunedin) who gave the guys a sailing lesson and took out the first 2 races of the day and now sits 3rd overall, tied with a consistent Werner Hennig (Hamilton) on points, just one ahead of Mike Knowsley who also had an extremely consistent day. With the contest now at the halfway mark, it is difficult to think of any more ideal sailing conditions than we have enjoyed so far. The one thing all the forecasts agree on for tomorrow is that it will be hot, 31degrees predicted, but the wind is a different story with a range of possibilities proposed. Hopefully, we will again enjoy a solid breeze and continue the exceptional conditions we have enjoyed to date. A fantastic first day for the Laser Nationals with clear skies, 30-degree temperatures and a lovely 10-knot breeze. Every wind forecast site anyone could find agreed, 10 -15 knot NE sea breezes would be it for the day. 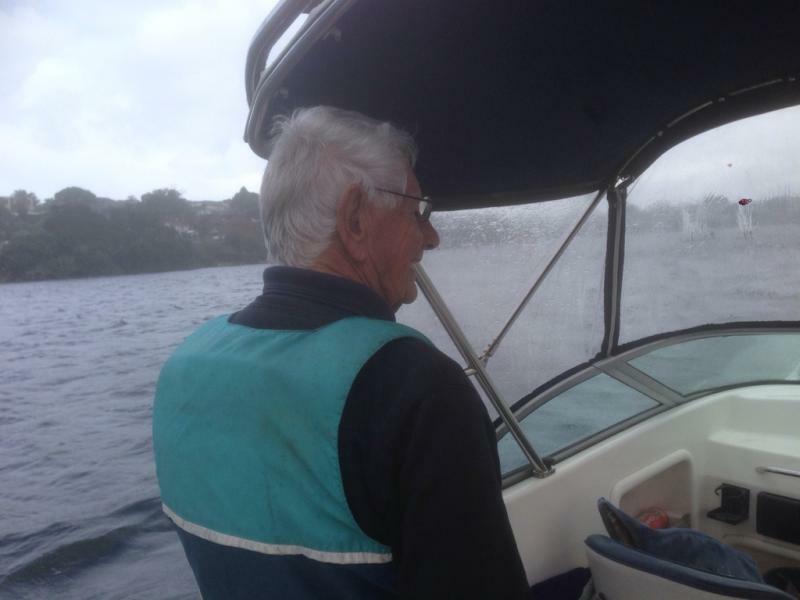 The only dissenter was the wind itself which decided to come in from the South so with trepidation the race committee set a course up into Charteris Bay and sure enough the southerly settled in for the afternoon and gave us two interesting races. Pressure variations, tide, a shifty breeze and a small slop provided challenging conditions for all with a few tide-induced early starters and a few swimmers proving that the challenges of the day were real, even if the water felt like we were sailing off a tropical island. The Standard Open and Standard Masters started together, with several of the Masters competitive upwind, but then the top Open sailors provided a masterclass in downwind sailing to put the Master's pretenders well in their place. In the Open there was very close racing between reigning champion and favourite Andrew McKenzie, George Gautrey from Muritai and Alistair Gifford from Tauranga. The three of them had a real tussle for the top spot in both races with Andrew just managing to get home first both times but only getting through on the last short beat to the finish in race 2. Unfortunately, George was OCS in race 2 to leave him some work to do to get back to the top of the table giving the third spot in race 2 to Rohan Lord, who had suffered an OCS in race 1. In the Masters Standard fleet, the lead changed several times in both races with very close racing among the top group as well as the Masters mixing it with a few of the Open fleet. In Race 1 Andrew Dellabarca (M) from Worser Bay managed to prevail from GM Chris Sadler (Tamaki) showing exemplary masters downwind technique to secure 2nd spot followed by Cris Brodie from Pupuke. In race 2 it was a similar story with Andrew holding out Cris Brodie while GM Nick Page managed to capture third place. In the Open Radials superior downwind speed saw reigning champion and 2017 World U17 Laser champion Josh Armit take both races convincingly. Behind Josh last years Youth Worlds rep Annabel Rennie-Younger had a very solid day with a 4/3 to sit 2nd and lead the World Masters Radial champion Scott Leith, who is tied on points with Albert Stanley from Worser Bay for 3rd. Women's favourite Susannah Pyatt was unfortunate to be OCS in the first race but made amends with a 2nd in race 2 while in the Youth Women Samantha Stock has a solid lead over the other Women's youth contenders. In the Radial Masters, local knowledge must surely have helped with GM Hamish Atkinson having a blinder with two bullets. Pre-contest favourite Ed Tam (M, Worser Bay) is tied on points for second with GM Werner Hennig from Hamilton. Kevin Welsh (GM) from Panmure scored a strong second in race 2 to sit 4th overall. So with 30-degree temperatures and a sea breeze again forecast for tomorrow it is anybody's guess what we will actually get but we will hopefully see 3 quality races for all fleets.